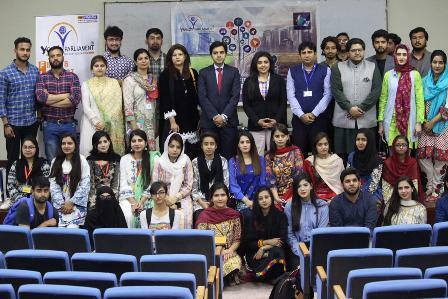 Dean’s Geographical Society in collaboration with Youth Parliament (Voice of the Next Generation) organized a conference of Youth on ‘Climate Change COY2 Pakistan’ on 21 March, 2019. It was a very informative session where students were enlightened about one of the world’s greatest crisis, climate change and how we could serve our nation in order to fight against it. Guest speakers from various honorable organizations were invited to conduct this session. The event was commenced with the recitation of The Holy Quran and the National Anthem of Pakistan. This was followed by the opening remarks from Muhammad Abubakar, President of the Youth Parliament. He welcomed the honorable guest speakers, Ms Ayesha Malik, Mr Mujtaba Bakir and last but not the least the Chief Guest of the event, Barrister Ambreen Qureshi, for gracing us with their presence. He introduced the guests briefly for their past achievements and then highlighted the need for creating awareness among the youth bodies about the need to cater environment related issues. The first guest speaker of the event was Mr Mujtaba Bakir, an assistant professor at GCU and a gold medalist within his field. He started his speech by pointing out the alarming situation of Climate Change within Pakistan where we are on the 7th position in the world’s most affected countries with having made no real contribution to it over the years. Moreover, he talked about the causes of Climate Change among which the scarcity of water is one of the most important reasons. He blamed the population growth for growing scarcity of water and urged students to raise awareness among others to conserve water. He also pointed out that dams are not the ultimate solution to everything as the maximum storage capacity of dams isn’t even 10% and the dam fund could be used instead to build better irrigation system for farming. The second spokesperson was Ms. Ayesha Malik who is affiliated with ‘Iqtidar’, a project by Imran Khan, which was inaugurated by Imran Khan in 2011. Its vision is that when political parties are no longer in government their vision is dissolved too. It works for building prosperous Pakistan. 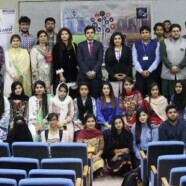 She informed the students that with the help of Iqtidar and UN as well as the Youth Parliament she is working for creating awareness in Pakistan about the environmental issues affecting Pakistan. She also acknowledged Climate Change as a major threat to Pakistan. Finally, the last speaker of the day was the chief guest, Barrister Ambreen Qureshi, a green lawyer who resolves environmental issues within Pakistan so things are better for the future generations of Pakistan. In her speech, she emphasized on the need for individual level awareness and the importance of Climate Change as an issue among other issues within Pakistan. She informed the student about their constitutional right to good environment under article of right to life. She encouraged students to spread awareness on an individual level among their families, friends and neighborhoods. She stressed that there should be recycling of plastic and straws should be banned as they cause an environmental risk. Furthermore, she highlighted the water scarcity issue in Pakistan and the need to conserve water. She also encouraged on taking initiative as a youth and breaching of environmental law like industrial waste should be reported. The conference was concluded with a thanking note from Prof Kashif Shafique, Chairperson of Geography Department at FCCU in which he expressed his gratitude to all the respective guest speakers. He thanked them for their contribution in raising awareness among students and encouraging them to take a stand as stakeholders. After that, shields were distributed among the guest speakers and organizers of the event. The certificates were distributed among all the participants of the conference. Once they were done with it a group photo was taken. And then, the guests were escorted into another hall for refreshments. All in all, the conference was a great success and was quite informative as well as motivating for the students. We as a society hope that its emphasis on creating awareness among the youth is met.